I've just had a great weekend. On Friday night Grant and Jane came off the hill and I cooked dinner. We were also joined by an old mate from Hanmer - Richie Hunter, and another friend Morgan from the village - so yeah a very social evening for me! Richie and I ran the Goods lift at Temple on Saturday in exchange for accommodation that night. we then headed up the hill and spent the greater part of the weekend updating some Alpine skills. 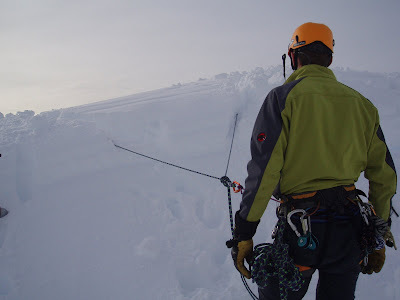 Our priority was avalanche transiever searches. We both set a goal of finding the beacon in under two minutes in a 20x20m area. It was good to get the practice in and use the expensive machines that spend a lot of time sitting around doing nothing! We both found that we could find the beacon signal quickly, then do a probe search, which could take a bit longer especially if the beacon was on a steep slope. Generally we were getting it in two - three minutes with a few shockers to begin with. Obviously the more you practice the better you get. We decided we'd done ok, but both needed some more practice. We also attempted some snow anchors. The snow compactability was very low- we couldn't make a snow ball, but for the sake of science we attempted some snow bollards. (see photo above) they failed in short order. we then dug t - slot anchors with v stakes and they failed quickly too. Then I attempted a deadman anchor while Richie put in an upright mid clip which is reportedly the best anchor in all conditions. We tried the deadman first and it held, but with significant 'settling', we then tried the mid clip and surprisingly it held remarkably well.We tried a few more attempts and found that the mid clip depended on good compaction and careful placement. This was a bit of a surprise to me as I'd always considered on t -slot to be better. This experience changed my mind for various reasons. We also did some lowers and raises, plus climbing sequences which were good practice for me. Today we attempted a stomper belay which i've had problems with in the past. We learned that you need to watch the climber carefully and bend your knees to add to the dynamics of the system, in doing that we felt that they were quite successful as a 'dynamic' anchor, and we gained confidence through practice. We also tried confidence roping which was a new skill for me, so thanks Richie! All in all it was a very rewarding session, and I felt we got a lot out of it. I have some skills to work on, but am far more focused on what needs practice. 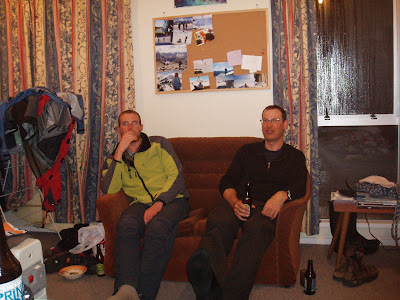 We both have an instructors assessment coming up in September.I really appreciate the generosity of the staff at Temple Basin for putting up with us, as well as Arthur's Pass Search and Rescue for their support. We both skied down from temple - the only skiing all weekend. The snow is starting to melt and the ground it a lot more vegetated than last week. I'm glad I skied the lines on Goldney I was able to when it was so good, as it may not be that good again until the next huge dump of snow!